As Refettorio Paris opens its green wooden doors, so launches the latest project from triple Michelin-starred chef Massimo Bottura’s “Food for Soul.” Every evening, this canteen– located in the crypt of the magnificent listed neo-classical La Madeleine Church– will serve comforting meals to the capital’s most needy. 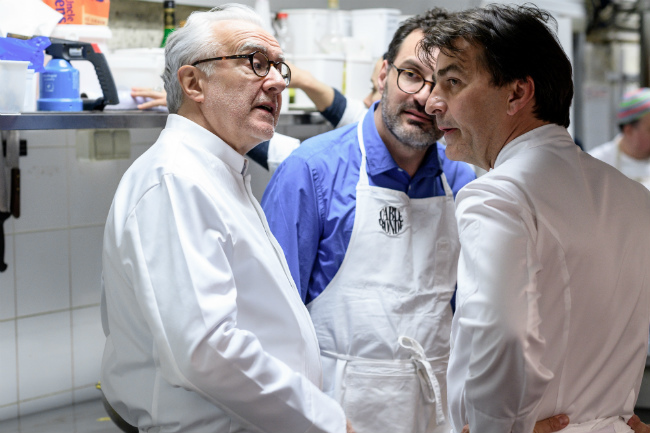 It will do this with support from superchefs including Alain Ducasse, Yannick Alléno, Michel Roux, Daniel Boulud, Massimiliano Alajmo etc. taking it in turns at the stoves. 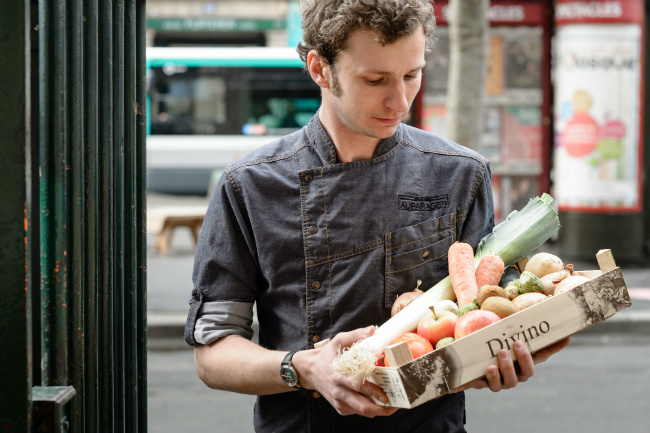 As part of the drive to combat food waste, dishes will be prepped with fresh ingredients nearing their sell-by dates – some products from the shelves of the Carrefour Market on Rue de Sèvres. 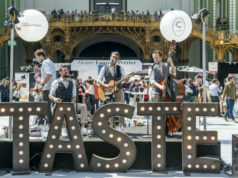 The team of chefs will recycle about 130 kg of food – partly collected from the Carrefour Market store – by the Ile-de-France Food Bank – transforming it into delicious, nourishing, balanced meals. 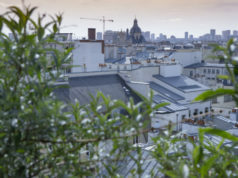 The start-up Phenix– of which Carrefour and its Foundation are partners – will also supply Paris Refettorio as well as Accor/Hotels, Fauchon, Banque Alimentaire, Metro and generous neighbors from the quartier. 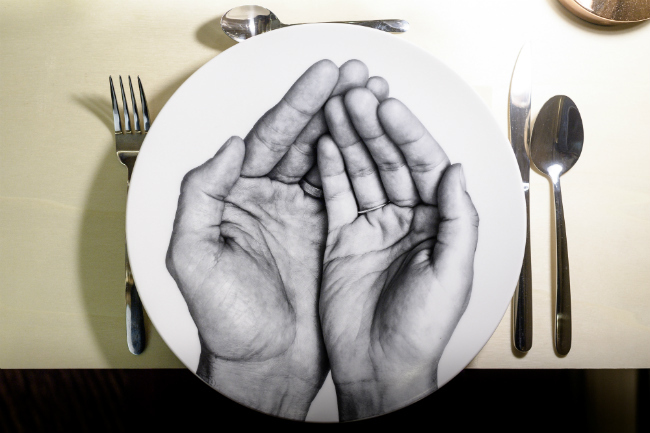 “Refettorio Paris combines ethics and the aesthetic, this is not a charity project, it’s a cultural one based on Food for Soul’s founding principal,” explains chef Bottura. 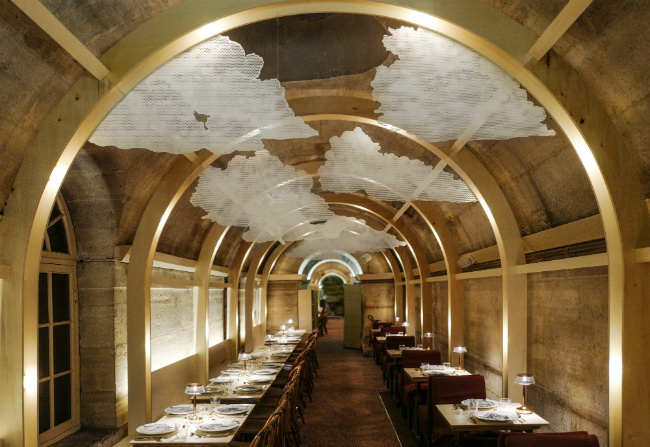 The architecture is by Ramy Fischler (RF Studio) and Nicolas Delon (Encore Heureux architects), and Refettorio Paris is also adorned with works by contemporary French artists Prune Nourry and her partner JR, known for their multi-disciplinary installations in public spaces worldwide. 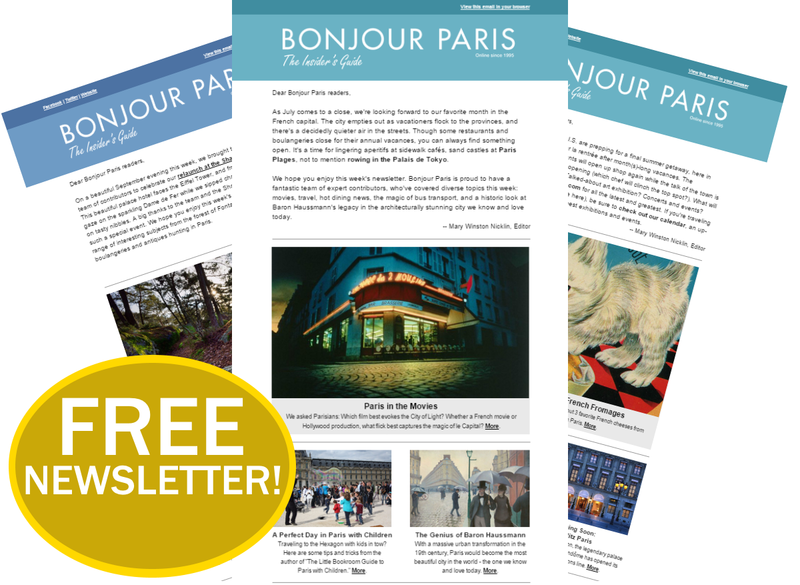 In the future, a rotating selection of artists will be invited to contribute to the history, life and soul of Refettorio Paris, beginning with Afghan artist Kubra Khademi. Food for Soul, a non-profit organization founded by Massimo Bottura, aims to encourage local communities to combat food waste while also promoting social inclusion and individual wellbeing. The first Refettorio — Refettorio Ambrosiano, Milan, Italy — was set up during Expo 2015. Additonal Refettorio were subsequently created in Brazil (Refettorio Gastromotiva, Rio de Janeiro) and the UK (Refettorio Felix in St Cuthbert’s Church, West London), as well as Italy (Social Tables Ghirlandina, Modena) and Social Tables Antoniano, Bologna. 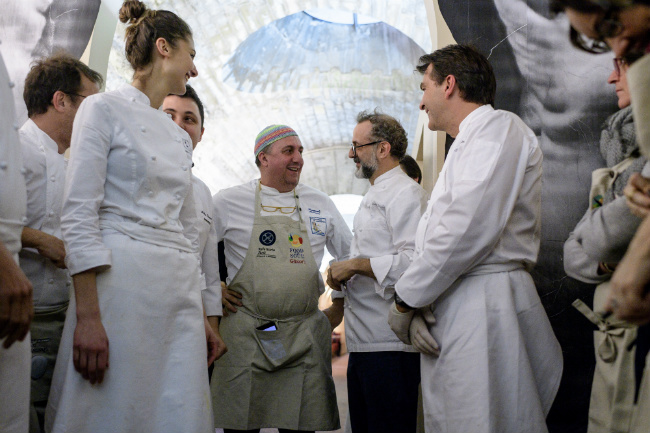 “It’s necessary to give something back, use everything, waste nothing,” insists Bottura. Created in 2000, Carrefour Corporate Foundation runs sponsorship programmes alongside retailers in the countries where Carrefour operates. With an annual budget of €6.75 million, Carrefour Foundation funds nearly 100 programs annually. Gregarious, charismatic, talented, triple Michelin-stared chef/owner of Osteria Francescana, Modena, Italy, number 2 on the World’s 50 Best Restaurants list. Bottura’s second Modena address, Franceschetta58, is located in a former tire shop. 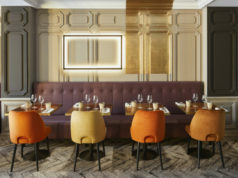 Then there’s the recently launched Gucci Osteria at Gucci’s Garden Galleria, Palazzo della Mercanzia, Florence and Torno Subito opening at W-Dubai – The Palm – in June. The book Bread is Gold, by Bottura and Friends, takes a holistic look at the subject of food waste, with 150 recipes for three-course meals from 45 of the world’s top chefs, including Daniel Humm, Mario Batali, René Redzepi, Alain Ducasse, Joan Roca, Enrique Olvera, Ferran & Albert Adrià and Virgilio Martínez. BIG’s recipes turn everyday ingredients into inspiring dishes that are delicious, economical, easy to make – and proceeds from book sales (€39.95) are donated to Food for Soul.